The new year came in with some celebration at 'The UFO Trail' when it received a Zorgy award for best paranormal website/blog. The awards were designated by Paul Kimball. He discussed them with fellow guest Aaron Gulyas on Greg Bishop's Radio Misterioso. It's tough to chart a course once you've achieved the ultimate in blogging, but fans of the Trail should not despair. Fresh ideas and interesting topics for consideration remain on the horizon. In all seriousness, the recognition is appreciated. 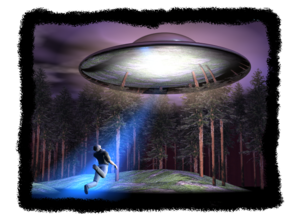 'The UFO Trail' is grateful for the comments and observations expressed by the three on Radio Misterioso. Thank you. Paul Kimball is a filmmaker and longtime member of the UFO community. He posts periodically at his blog, 'The Other Side of Truth', and one of his videos containing footage of the late Dr. John Mack was recently the subject of a blog post here at 'The UFO Trail'. Greg Bishop is well known for his book, 'Project Beta: The Story of Paul Bennewitz, National Security, and the Creation of a Modern UFO Myth'. Bishop was subsequently featured prominently in Mark Pilkington's well received film, 'Mirage Men'. Aaron Gulyas is a history professor and writer with interests in paranormal subject matter. His remarks on Radio Misterioso were refreshingly moderate and well conceived, and one would hope such examples would become more the rule than the exception within the genre. The trio discussed Project Core in addition to the Zorgy awards. Project Core was a private research endeavor in which over 200 self-described paranormal experiencers were surveyed. The resulting data was professionally organized and presented. Project Core researchers included Jeff Ritzmann, Jeremy Vaeni, Dr. Tyler Kokjohn, Dr. Ellen Tarr and Dr. Kimbal Cooper. The team successfully identified areas of interest for possible future study while avoiding drawing premature conclusions that typically hamper such studies from earning legitimacy. Keep looking forward, ufology. It's not all bad.